A recent news story about a Saline, Michigan man that created a mechanical beast to imitate the famed Loch Ness Monster in a local lake as part of a local Celtic Festival reminded me of a similar creation some years back on the Western side of the state. I stumbled on the story when I was a young man working on the Kalamazoo Gazette, in Kalamazoo, a city that joined Portage. I don’t recall his name name or all of the details so my story will be vague. As the story went, an elderly gentleman who had lived all of his life on one of the four or five lakes in Kalamazoo County, told his story after years of fooling the people in the area with his cleverly concocted ruse. Naturally the news spread. 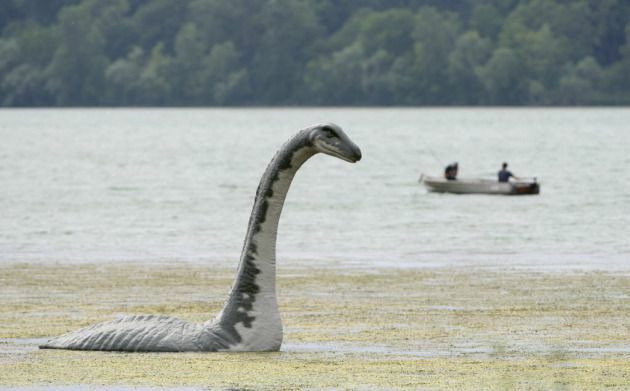 The story of the Portage Lake Monster was told in the area for years. Many people liked to embellish their “eyewitness” account of their sighting when talking to reporters. Some even thought they saw glowing red eyes and a hump or two rising with it from the lake. His wood and steel monster is 24 feet long when floating under water, and rises six feet high when raised. Unlike the Portage monster, this one is a device that operates on ropes and pulleys.